Things have changed quite drastically since Múm landed on TMT Entertainment in 2001 with the hugely poetic and overly electronic Yesterday Was Dramatic, Today Is OK album, and the remix album that followed. The band was formed by Gunnar Örn Tynes, Örvar Þóreyjarson Smárason toward the end of the nineties, and shortly after, twin sisters Kristín Anna and Gyða Valtýsdóttir joined them. Since, the band has gone through many changes. In 2002, Gyða left, followed a couple of years later by Kristín, leaving Tynes and Smárason to head a constantly changing line up, until the current one came together to record Go Go Smear The Poison Ivy, released on Fat-Cat in 2007. The album signalled quite a radical shift in musical direction as Múm appeared to leave their delicate electronic textures behind in favour of a much more acoustic sound, not that far apart from the magical kingdom of Danish ensemble Efterklang. 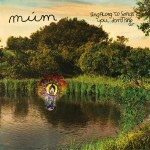 Sing Along To Songs You Don’t Know, Múm’s fifth album and their first for German imprint Morr Music since the 2001 mini album Please Smile My Noise Bleed, continues pretty much where Go Go Smear The Poison Ivy left off, focussing once again on deceptively naive pop songs, alive with rich sounds, catchy melodies and heart-warming harmonies. Very much like with its predecessor, Múm draw from a multitude of instruments (guitars, prepared piano, ukulele, marimba, strings, dulcimer) to create a beautiful and evocative layered sounds where sub melodies constantly add to the core structure of a piece, occasionally highlighting a point or giving out a vivid glow to a particular melody or instrument. The album starts with the surrealist and poetic If I Were A Fish, on which the band create a warm campfire song feel and juxtapose brushes of slide guitars and earthy brass slabs. Sing Along, which follows, continues on a similar mood but also sees the band bringing electronics back in. Later, A River Don’t Stop To Breathe, Illuminated or Blow Your Nose make beautiful use of the string quartet by giving it a central place, especially on the latter, adding delicate marimbas and piano touches to accentuate the pastoral feel of the respective pieces. Prophecies And Reversed Memories or the magnificent Húllabbalabbalúú and Kay-Ray-Kú-Kú-Kó-Kex are pivotal moments on this record, the former signalling a momentary change of pace, the latter two, with their underwhelming rolling anthemic melodic themes never cease to grow through their respective courses. Although very different, these three songs seem to focalize the cinematic breadth of Múm like never before. Elsewhere, the band draw on subtle traditional folk forms on The Last Shapes Of Never to once again reiterate the bucolic aspect of the record, teeming with life, vivid colours and rich sound, before closing the proceedings with the darker and reflective Ladies Of The New Century. The only true faux-pas of this record is to be found on the rather tedious and gimmicky The Smell Of Today Is Sweet Like Breast Milk In The Wind, which crushes the lyrical spell of this record half-way through. Sounding totally out of place and irrelevant with its over-active cheap drum machine hammered over a somewhat weak melody, it is best skipped entirely. Unlike its predecessor, Sing Along To Songs You Don’t Know is something of a slow burner, which takes its time to reveal its many facets. Múm never quite reach the heights of Go Go Smear The Poison Ivy, but it is fair to say that it never feels as if that it their main preoccupation. Initially a tad lacklustre, especially in its first half, this album still finds Múm in exquisite musical grounds and sees them continuing to mature steadily.